I think this is one of the best sizzling pork dishes you can serve or eat as a viand or as “pulutan” along with your favorite alcoholic beverage. This is a little exotic to those who haven’t eaten parts of the pork that consists of ears, snout and tongue. But to those eats them, I think this is the best sizzling dish for you. Just make an extra step on cleaning the pork tongue because it will taste awful if you don’t. Boil the tongue first with few tablespoon of vinegar. Discard the water, rinse, and remove the skin. Then boil it again along with the rest of the pork parts until tender. 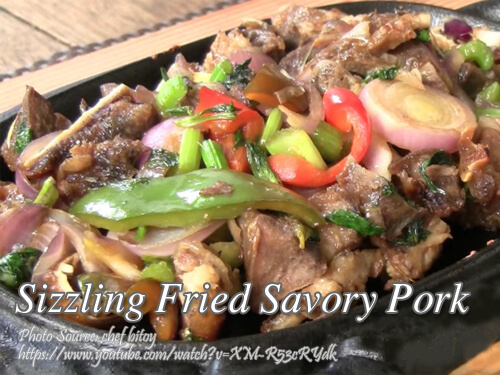 To cook sizzling fried savory pork; Wash and clean the pork ears, snout and tongue. Remove hairs by shaving or a knife. Boil the pork until tender and drain. Marinate pork with vinegar, garlic and salt for at least 1 hour. Sprinkle pork with cornstarch and mix until all the pieces are well coated. Heat oil in a deep pan and fry the pork pieces until crispy and golden brown. Place pork in a paper towel or colander to drain excess oil. Set aside to cool. Cut pork pieces into strips using a scissors or a sharp knife. Brush wok with some oil then place in high heat and wait until a wisp of smoke appears. Then put the fried pork strips, onions, celery and bell peppers. Saute or stir fry for about 15 minutes or until the vegetables are cooked but still crispy. Wash and clean the pork ears, snout and tongue. Remove hairs by shaving or a knife. Boil the pork until tender and drain. Marinate pork with vinegar, garlic and salt for at least 1 hour. Sprinkle pork with cornstarch and mix until all the pieces are well coated. Heat oil in a deep pan and fry the pork pieces until crispy and golden brown. Place pork in a paper towel or colander to drain excess oil. Set aside to cool. Cut pork pieces into strips using a scissors or a sharp knife. Brush wok with some oil then place in high heat and wait until a wisp of smoke appears. Then put the fried pork strips, onions, celery and bell peppers. Saute or stir fry for about 15 minutes or until the vegetables are cooked but still crispy. Pour the liquid seasoning and mix for 1 to 2 minutes until all the pork and veggies are well coated. Prepare a sizzling plate by brushing oil and placing the cast iron plate in a heated stove until smoke appears. Add the pork and veggies in the sizzling plate, put the plate in a wooden tray and serve. Hi Manny, what if I don’t have coconut vinegar? Can I replace it with apple cider vinegar or white vinegar? Hi Annie, sure you can use apple cider or white vinegar.